VINCENT BERARD REF. LUV2 001 LUVORENE 1 WHITE GOLD Vincent Berard, Swiss, "Luvorene 1" Ref. LUV2 001. Made circa 2012. Very fine and unusual, large, water- resistant, manual wind, 18K white gold wristwatch with 10-day power reserve, phases of the moon, days of the week display and an 18K white gold Vincent Berard buckle. Accompanied by a fitted box. Three-body, polished, rounded bezel, case back with 4 screws, hinged outer back with 2 sapphire crystal port holes to display the moving second hand and the power reserve indicator, sapphire crystal. Guilloche black with applied white gold indexes, outer minute track, subsidiary dials for the seconds, the days of the week and the moon phases, aperture at 3 for the visible "mysterious balance." Skeletonized white gold feuille hands. Cal. 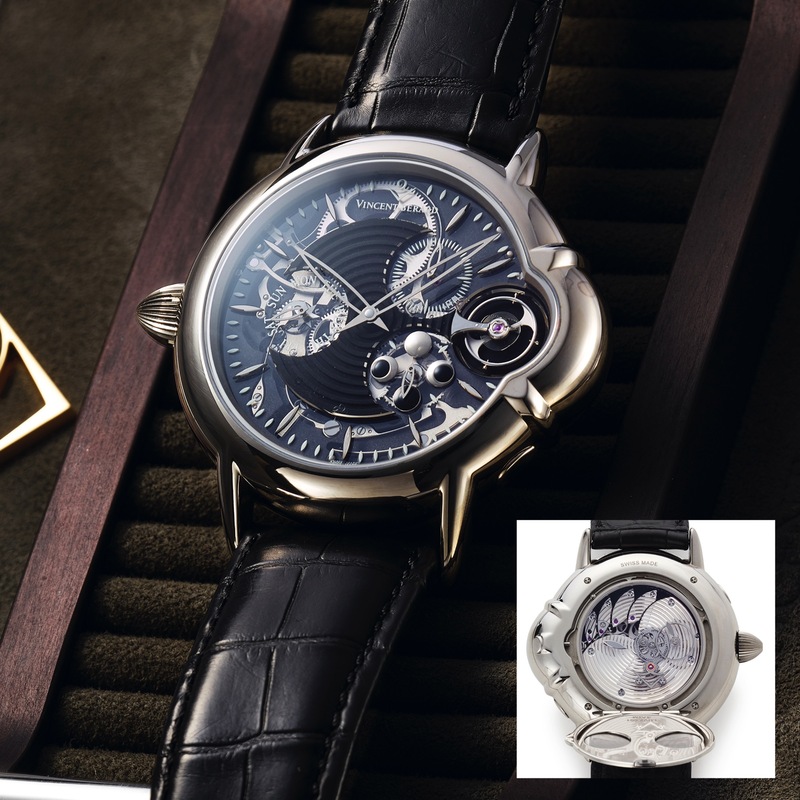 VB441, circular guilloche finished, five spindle-shaped bridges on 5 levels, straight-line lever escapement, monometallic (mysterious) balance, shock absorber, self-compensating Breguet balance spring. C. Three-body, polished, rounded bezel, case back with 4 screws, hinged outer back with 2 sapphire crystal port holes to display the moving second hand and the power reserve indicator, sapphire crystal. D. Guilloche black with applied white gold indexes, outer minute track, subsidiary dials for the seconds, the days of the week and the moon phases, aperture at 3 for the visible "mysterious balance." Skeletonized white gold feuille hands. M. Cal. VB441, circular guilloche finished, five spindle-shaped bridges on 5 levels, straight-line lever escapement, monometallic (mysterious) balance, shock absorber, self-compensating Breguet balance spring. Dial, case and movement signed. DIAM. 42 mm. THICKNESS 14 mm.